Raoul Wallenberg Field — Washington, D.C. 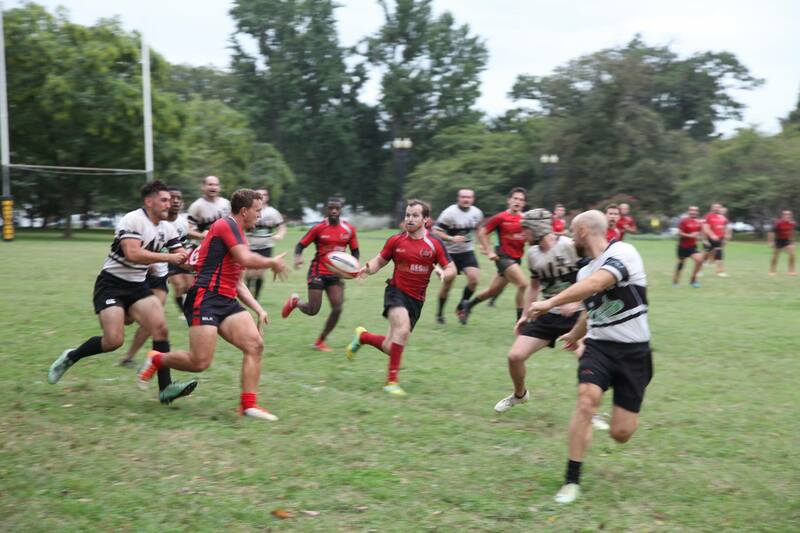 Playing in front of a home crowd in the heart of the nation’s capital, the Potomac Exiles picked up a bonus point in a 26-37 loss to the Schuylkill River Exiles. Schuylkill River came out of the sheds hard in the first half and turned sustained periods of pressure into points in the early going. The visitors built up a 10-0 lead thanks to a converted try and penalty in the 10th and 30th minutes. Though dormant for most of the first half, PERC’s offense woke up in the 32nd minute when the home side drove down the pitch and secured a scrum deep in Schulykill’s 22. After several cracks at the try line, Potomac got on the board when captain Guy Lopresti dotted the ball down off the back of a maul. Although PERC had several bright spots in the first half, including some effective counter rucking by the tight five Lopresti’s try would be PERC’s only score until the 69th minute of the match. In the interim, Schuylkill found the try zone three more times and added two penalties to push the score to 5-37. Despite the slim odds for victory, a determined PERC side showed off the potential of its potent offense in the final fifteen minutes of the match. Bolstered an influx of impact reserves, including Owen Lentz, Ben Wiedemer, Gabe Free, and Garvis, Potomac scored a rapid succession of tries. The first came in the 68th minute. After PERC regathered its own restart deep in Schuylkill territory, a well-structured attack led to a penalty ten meters out from the try line. Captain Guy Lopresti received the ball from a quick tap and barrelled over several defenders to score. Lopresti converted his own try to bring the score to 12-37. Moments later, Potomac found the scoresheet again when center Ben Matu scored under the posts after a period of continuous attack in the opposition half. Lopresti slotted the conversion to narrow the margin to 19-37 in the 73rd minute. After controlling the restart, PERC once again drove down the field after beautiful interplay between forwards and backs resulted in a long Gabe Free run down the touchline. Wing Joenel Joseph found the try zone a few phases later and Guy Lopresti hit the conversion to bring the final score line to 26-37. Prop Dante Lopresti earned Man of the Match honors for his consistent work rate around the pitch and settling presence in the set piece. Although the men from PERC were disappointed with the result, they took heart in the fact that they were able to secure a much-needed point to keep pace in the tough Mid-Atlantic competition. Next up, the Potomac Exiles travel to Pittsburgh to take on the Harlequins at Founder’s Field on October 13th.